The patty melt is a classic. And it’s surprisingly easy and quick to slap one together at home. Here’s how to make it. 2. Slice the onions into fairly thin rings (we sliced ours about 1/8-inch thick) and add them to the skillet, stirring to coat with oil and continuing to stir and poke and pat and move around until onions become limp, 5 to 7 minutes. 3. Add salt and stir to incorporate. 4. Add the wine and raise heat to high for 1 minute or so, stirring constantly until liquid evaporates, then return to medium and add butter, stirring until melted. 5. Cook, turning the onions in the pan frequently for another 10 to 15 minutes or until they are nicely golden brown and they look awesome. [Editor’s Note: Just to be clear, the onions are not going to be caramelized after this short amount of time. And that’s okay. Although if you really want caramelized onions, be our guest and let them cook at least another 30 minutes or so. Remove the pan from the heat. 6. Preheat one of the cast-iron skillets over medium heat and add a drop or two of oil to coat the surface. Preheat the second skillet over medium heat. 7. Form the ground beef into 4 or 5 balls of beef (they should be heaping). 8. Once the first skillet with the oil is hot, drop the balls of beef into the pan, one or two at a time. Season with salt and smash them flat so each patty is just smaller than the slice of bread. Cook the patties, without touching them, for 3 to 5 minutes. Flip the burgers and cook them for 2 to 3 minutes more for medium-rare. 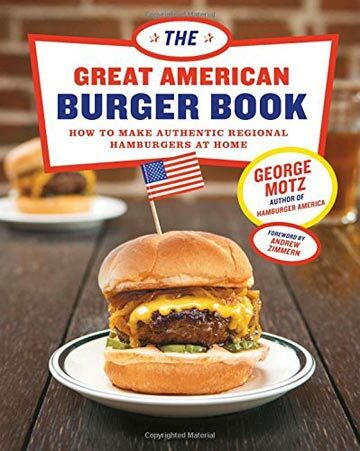 (If a crustier surface is desired, crank the heat to medium-high when you cook the burgers.) Transfer the burgers to a wire rack placed over a plate. 9. Butter 1 side of each slice of bread. Place 1 slice of bread in the second skillet, butter side down. Add a slice of cheese on top of the bread, followed by a cooked patty, a forkful of onions, followed by another slice of cheese and a second slice of bread, butter side up. Cover and cook for 2 1/2 minutes, keeping an eye on the sandwich so the bread doesn’t burn. Then flip the whole thing and cook for 1 minute more, without a cover. 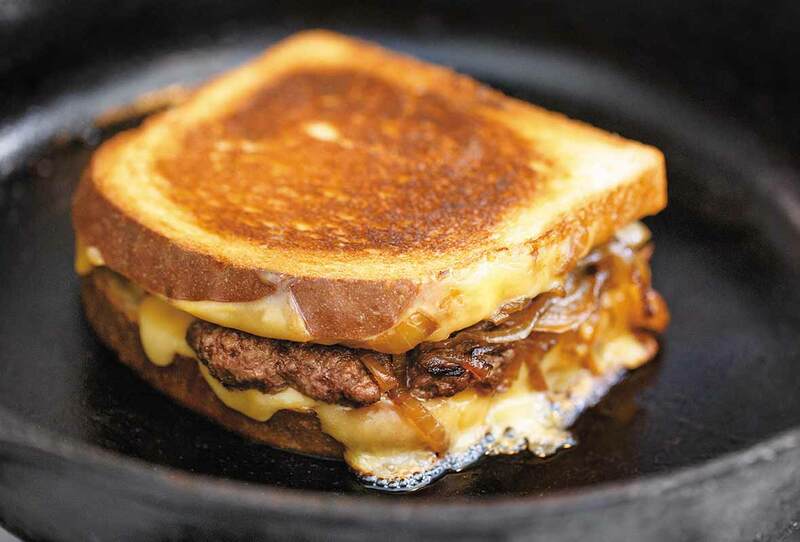 Using a spatula, remove the patty melt from the skillet and shimmy it onto a plate. Repeat with the remaining patties, buttered bread, cheese, and onions. Consume immediately. Can something so simple really be this good? In the world of gourmet gastro pub burgers with all sorts of toppings and flavor profiles, I found myself perfectly content and satiated with this patty melt sandwich which was probably more popular 50-plus years ago. Talk about comfort food. I enjoyed every last bite! I loved the buttery crunchy exterior and the juicy, meaty, cheesy, sweet and savory flavors inside of the patty melt. This is one sandwich that needed no extra condiments, it was so incredibly flavorful all on its own. I will admit, I don't think I've ever had a patty melt until today...and wow, I've been missing out! You would think that such a simple-sounding sandwich—basically grilled cheese with some grilled onions and a hamburger patty—wouldn't require a recipe, but I'm so glad I had this one to follow! I used Vidalia onions and was cooking for 3 people and even so, 2 onions were just enough for 3 servings because we love grilled onions. I didn't have any white wine on hand so I used sherry and it was a perfectly fine substitute. After the sherry reduced, I also added about 1/2 tablespoon Worcestershire sauce for a little extra added depth of flavor and a pinch of ground Spanish pimenton. For the cheese, I used a medium-sharp yellow Cheddar which still melted well. (I'm not a huge fan of American cheese.) I used a pound of ground beef—15% fat 85% meat—for 3 generous patties. I didn't use any black pepper as I normally would, but honestly, the patty melt didn't need it, it was perfect as is. I picked up a loaf of white sandwich-style bread from my local bakery and I loved how it crisped up in the skillet. I purposefully left my butter out for hours before I made this so it would easily spread on the bread prior to grilling. I served the patty melts about 20 minutes after I made them and just kept them sitting in the warm cast iron skillet that I grilled them in and the bread stayed nice and crisp and the patty melts were still warm when consumed. I will definitely be making these again. My love affair with the patty melt goes way back to my late teens, but these days it's hard to find one on a menu. As soon as I saw this recipe, I knew I'd have to make it. The burger has a light texture that allows the sautéed onions and cheese to meld together into gooey goodness. The crispy bread adds a nice contrasting crunch. Added bonus: It's an easy recipe to use for a weeknight meal. By making this recipe at home, I have confidence about where my ingredients come from and I can be sure to use quality, local beef. I'll never have to look for a patty melt on a restaurant menu again. I wanted a little more color on my onions, so after adding the wine and butter I cooked them for 15 additional minutes rather than 10 minutes. It made a significant difference in the color. I used medium high heat for my burgers and medium heat to grill the sandwich, 3 minutes on the first side, 1 1/2 minutes on the second side. I make burgers a lot—and when I say a lot, I mean at least weekly, either on the grill when the weather is nice and we want something that feels seasonal and special or just on the stove when we need something quick, easy, cheap, and versatile. I'm ashamed to say that though I consider myself a pretty well-rounded cook, I've never actually made a patty melt in my own home, which is ridiculous because it's basically a cheeseburger in sandwich bread instead of a bun. Or a grilled cheese with a burger in the middle. Either way, this recipe is not that much effort but elevated a plain old hamburger to a whole new level of comfort food. This recipe is a star for me for two reasons. One, using a nice crusty white bread makes it richer and fancier (who doesn't love how well a nice fluffy white loaf can soak up butter?!). And two, the caramelized onions, which are such a small touch pack a mean punch. Best part? It's easy enough to throw together for a late dinner home alone on a Wednesday night or for a Friday date night in. I doubled the onions and the ones I couldn't fit into the sandwiches I served on the side. I used my mandoline to slice the onions on the "very thin" attachment. I had to cook the onions for about 5 or 6 minutes before they got "limp" but cooked them nearly 45 minutes before I thought they were satisfactorily caramelized. This patty melt recipe produced a delicious and juicy cheeseburger. Classic Patty Melt Recipe © 2016 George Motz. Photo © 2016 Kristoffer Brearton. All rights reserved. All recipes and photos used with permission of the publisher.